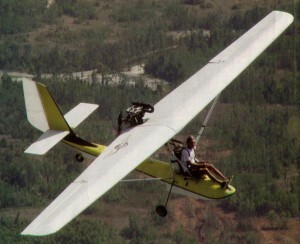 Built by Bob Bailey, circa 1991, the Connie utilises a single Cosmos trike float and qualifies as a Pt.103 ultralight. The float is the primary structural unit. Baily fitted a modified version of his Tempest ultralight sailplane wing and a Rotax 447. The main undercarriage retracts with a simple lever. On the prototype, the tailwheel retracts but this may change in a production version. The Connie may be produced with Baliey’s partner, Bill Moyes.